Lila and Jay Cooper have joined their dad on a mission to the jungles of Central America, where a group of American treasure hunters have already become the victims of the deadly curse of Toco-Rey. Before Dr. Cooper can solve the mystery, his children are kidnapped and his integrity is put to the test. What price will he pay to get his children back? Is the treasure in the burial tomb of Kachi-Tochetin really worth more than gold? Follow the Coopers as they explore unknown ruins, plunge through dangerous jungles, face hostile natives, and battle ancient evil forces. Will their courage and faith in God bring them through? 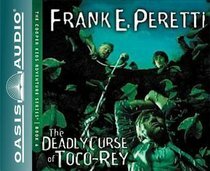 About "The Deadly Curse of Toco-Rey (Unabridged, 2 CDS) (#06 in Cooper Kids Audio Series)"
Order now to secure your copy when our stock arrives. Other edition is available. 1581346190 0 Available. Expected to ship in 5 to 6 weeks from Australia. Order now to secure your copy when our stock arrives. Other edition is available. 1581346182 0 Available. Expected to ship in 4 to 5 weeks from Australia.